When it comes to balancing work and life, Linden Cornett seems to have found a really interesting way to do that. Last time we spoke with her she had promised her family to not work as much by taking on only 5 new clients per year. In this episode we catch up with her to see how this plan has gone and how she is balancing family life, her practice and a part-time job. Linden gives us some awesome and specific information on who she chooses to work with, what specific things she helps people with and how much the business has grown over 3 years. She discusses the research she has done on the new tax laws that came into effect last year and gives advice on leveraging funds to help her clients donate more efficiently to their favorite causes. Getting caught up with Linden and how she’s been doing since we last talked on the podcast. Her schedule and how she balances family life, her practice and working part time at Intel. Why she has stayed with her part-time job instead of going full-time with her practice. How many clients she has, who they are and what she does with them. Why she works with her family and how she navigates the intricacies of working for free and avoiding potential conflict. Why she decided to have multiple custodians and how she manages them effectively. How she manages her time with clients. Her current fee structure for the 3 services she provides. The benefits of restricting her client intake and how that has effected her growth. The details on her research of the new tax laws and how to leverage charitable contributions. The biggest lessons she has learned over the past 3 years. How she handles fee changes with her clients. What she plans for the future of her practice. 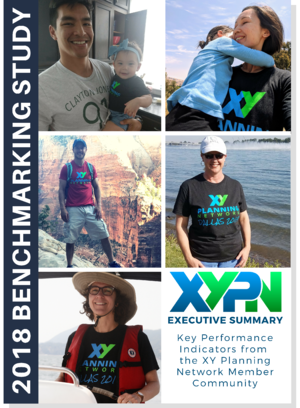 XY Planning Network’s Annual Benchmarking Survey is out! Are you curious about the average number of clients XYPN members get in their first year? Or how successful niches really are? To answer these burning questions and more, we’ve again enlisted a professional research firm to complete our annual benchmarking study. Get your copy hot off the press and discover vital statistics such as the median advisor revenue by years in practice and sources of firm growth, from referrals to blogging, social media and more. Head over to info.xyplanningnetwork.com/2018-benchmarking-study to purchase your copy.